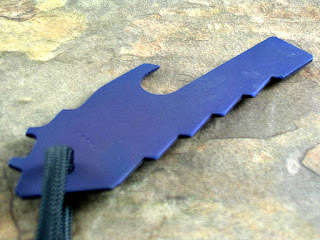 The flat spannerbabies are a new tool by Peter Atwood from a new line of very thin tools. They are made of .050 titanium and are thin to carry in a change pocket, a wallet or in a keychain. They feature a spanner wrench for Strider folding knives, a screwdriver for Hinderer and Emerson pivot screws and a bottle opener. The tool can also be used for little prying or scraping, popping tape, opening boxes etc. The tool is very beautiful and thin and is probably an ideal companion if you carry a strider folder, if you don't it is still a very useful tool that as other Atwood tools will be useful in many situations that you wouldn't expect. Available in plain bead blast and solid colors only. Bronze, purple, blue for $25 from Peter Atwood's website.